Keep warm whilst you sleep under stars with your own photo camping blanket, featuring snapshots of your happy memories or your own artwork. A large 150 cm x 150 cm printed blanket will keep you cosy during the cool nights, and a waterproof base means it doubles as an excellent comfy layer in your tent on damp days. Even in the warm English Summer, there are plenty of chilly evenings – especially while you’re camping. Keep warm and comfortable at night with your own personalised camping blanket, featuring your own photographs or artwork. Created from a luxuriously soft fleece fabric, it’s certain to keep the warmth in and make your tent extra snuggly. A waterproof base layer helps keep the damp at bay, and also allows the blanket to double as a sitting area during the day on wet grass. Don’t worry about the extra bulk – this gorgeous blanket rolls up with a strap which doubles as a handle, so you can carry it amongst your camping gear with no problem at all. At 150 x 150 cm in size, it’s the ideal camping accessory for ultimate comfort. This is the second time i have ordered from bags of love and I'm delighted with the result. The website is easy to use and there is online support if needed.i would recommend them for high quality and great service. What Will My Photo Camping Blanket Look Like? At the large size of 150 cm x 150 cm, your new blanket is grand and luxurious – and incredibly versatile. The fleece face gives the blanket a lovely, soft to the touch finish, and displays your print beautifully edge-to-edge across the top of the blanket. The bottom of the black has a smooth, matt black waterproof base. Although the blanket is large, it’s incredibly lightweight and can be easily carried with its strap and handle. Who Will Love These Blankets? These super soft camping blankets are perfect for everyone! Whether you’re a solo traveller or a keen camping family, the multi-purpose item is incredibly versatile meaning it can be used in any way you like. 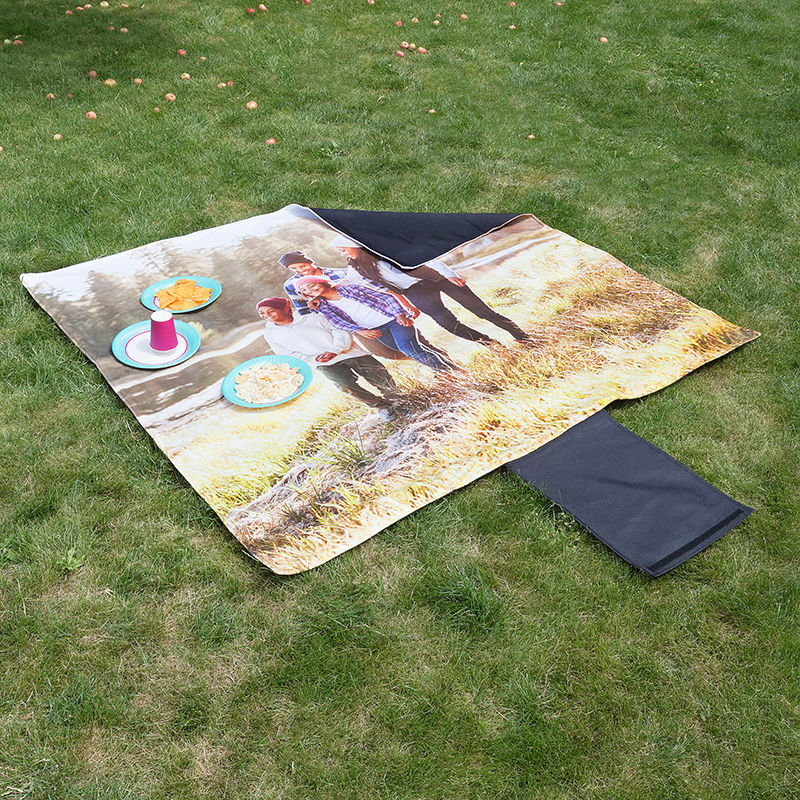 It also doubles up as a lovely picnic blanket, ideal for catching some rays in the park with your friends or hosting a Summer garden party. Using sublimation printing, environmentally friendly inks are directly locked into the fibres of the fabric, which results in a stunning long-lasting print. The colours are vibrant, the tone is even and consistent, and the details are strikingly sharp. Every blanket is printed and sewn by hand in our London based studio, by our skilled textiles professionals. We’re so sure you’ll love this product, that it even comes with a 10-year guarantee. Photo camping blankets make a wonderful keepsake gift for any loved one off on some exciting travels. Adorn the blanket with photos of you together, arranged into a beautiful collage using our online photo montage option. Simply add multiple photos to the design in the online studio and choose your frame to arrange the photos in a funky design. You could also create a unique blanket for festival camping – opt for some bright colours and psychedelic patterns to match the vibe of the festival, and so that your friends can easily find you from afar!